Dark red head with green shoulder coverts and large upperwing. Blue wings, rump, uppertail coverts and tail tip. Naked cheeks with red lines, upper mandible pale with greyish on sides. Eyes yellow, legs charcoal. Female smaller. Imma-tures have dark eyes. If you want an affectionate bird, then the Greenwing Macaw might be the bird for you. In fact, these gorgeous parrots are known to many as "the Gentle Giants" due to their sweet dispositions. They are highly responsive to training, and must be given adequate attention and bonding time due to their social natures. Those interesting in adopting a Greenwing Macaw should make sure that they have enough time to spend with their new bird. Parrot food with fruit, greenstuff, sunflower seed kernels, fresh corn and nuts, such as brazils. The Green Winged Macaw bill can be devastating to woodwork, so provide branches as distraction. Although they are not known to be quite as active as other large parrots, Greenwing Macaws still need plenty of exercise for both their mental and physical stimulation. 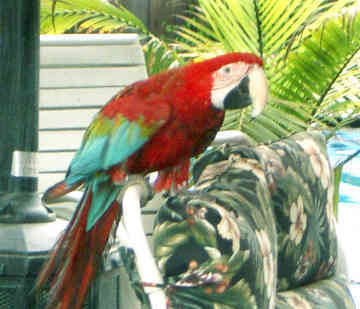 Owners of a Greenwing Macaw should allow for 2-3 hours of supervised out-of-cage playtime every day to make sure that their bird maintains top physical condition. Quiet, tame, intelligent, kind to children and other pets, but easily frightened by noises and motion. When excited, bare facial area reddens in response to blood flow. Large, strong cage and parrot stand as a free perch when kept in the house. Aviary in the garden with heatable interior room. Provide fresh branches. Close pair bonding. Lays 2 to 3 eggs, incubation 24 to 28 days, fledging 95 days.